Being Frugal and Making It Work: Giveaway Ending Tonight: Purex Baby Detergent - 3 Winners! 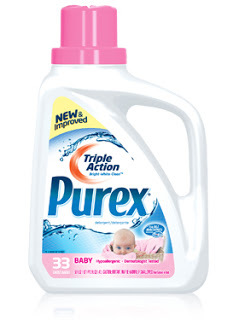 Giveaway Ending Tonight: Purex Baby Detergent - 3 Winners! We all know that laundry is a never ending household chore. If you or someone you know has an infant or is expecting, this is the perfect giveaway for you! Don't miss your chance to win some Purex Baby Laundry Detergent! To make the giveaway even better... there will be 3 lucky winners! What is your favorite Purex laundry product?